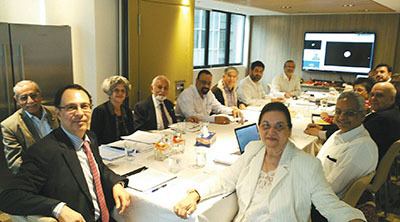 The Federation of the Parsi Zoroastrian Anjumans of India will host the Global Working Group meet on December 20 at the Banaji Atash Behram Hall in Bombay. Delegates from India, Iran, North America, the UK, Pakistan, Dubai, Australia, New Zealand, Singapore, Hong Kong and South Africa are slated to attend. A report on the 11th World Zoroastrian Congress to be held in Perth, Australia in June 2018 will be presented by Congress chair Firoz Pestonji while the president of the Federation of Zoroastrian Associations of North America Homi Gandhi will brief delegates on the venue selection for the 12th World Zoroastrian Congress. Other topics include "Resettlement of Zarathushtis” by Rohinton Rivetna, "Demographics, listing of individuals on global directory” by Yazdi Tantra and "Distribution of liturgical and religious supplies worldwide” by Dinshaw Tamboly. Image: Global Working Group (GWG) at the meeting held in Hong Kong on December 15 and 16, 2016, from Parsiana's archives.